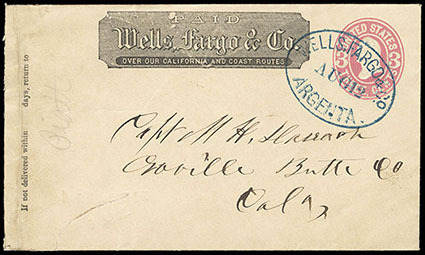 Wells, Fargo & Co., Argenta, complete bold strike of oval datestamp (11-9) on 3¢ pink (U59) buff entire to Oroville Cal. ; sealed cover tear at lower left, Extremely Fine, ex-Hertz. 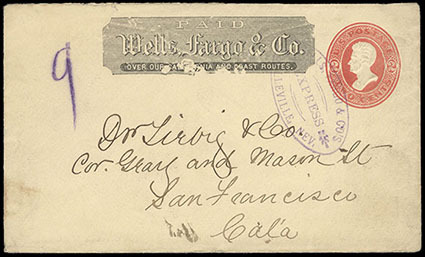 THE ONLY RECORDED EXAMPLE OF THIS WELLS FARGO & CO. ARGENTA DATESTAMP. 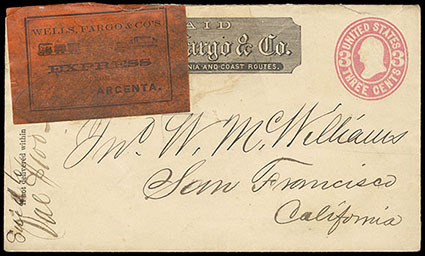 Wells, Fargo & Co., From Argenta (Nev.), black on orange printed label (WFCX-L542) with illustrated Train and Steamboat, manuscript "Battle Mountain" lightly written on label, affixed on 3¢ pink (U59) entire with printed Wells Fargo frank to San Francisco Cal., manuscript "Val. $100" at bottom left, couple minor edge tears and label slightly affixed over edge of entire, F.-V.F. and rare. THE ONLY RECORDED EXAMPLE OF THIS WELLS FARGO & CO. ARGENTA LABEL. In October of 1868 the Central Pacific Railroad arrived in the area. A small siding was built to serve the mines, but the main train station for the region was laid out fourteen miles further east, this station was named Argenta by Charlie Crocker, the superintendent of the Central Pacific Railroad. Here a town was laid out and a hotel was built to serve the traveling public. For a short time Argenta prospered, but as soon as the tracks reached the new railroad town of Elko, closer to the brand new gold rush at White Pine, Argenta faltered and died. No one bid on the lots in the town the railroad had laid out and only two frame buildings were ever built, the hotel and the general store. Wells, Fargo & Co., Battle Mtn Stn, Feb. 19, perfect strike of blue oval handstamp on 3¢ green entire (small corner at top right) with company frank to Sacramento, with original enclosure datelined "Battle Mountain, Oct. 6th, 1878" on Wells, Fargo & Co. stationery, Very Fine and choice, quite certainly one of the finest strikes of the rare Battle Mountain Station express marking. 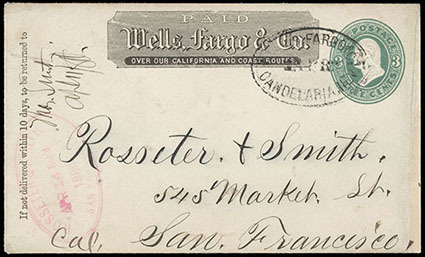 Wells, Fargo & Co. Express, Belleville, Nev., purple oval handstamp (Leutzinger 10-19) on 1870, 2¢ vermilion entire to San Francisco, company frank at top, Very Fine, town unlisted in Leutzinger. 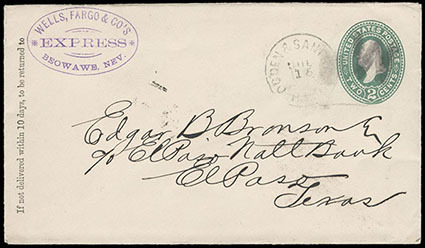 Wells, Fargo & Co. Express, Beowawe, Nev., superb violet oval handstamp on 1887, 2¢ green entire to El Paso, Tex. with Ogden & San Francisco Railway Post Office cds, Extremely Fine. 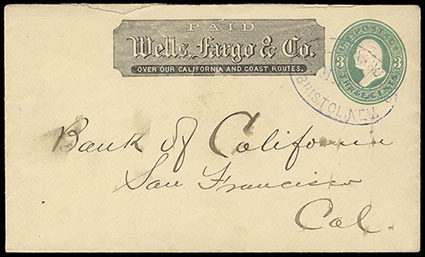 Wells, Fargo & Co., Bristol, Nev., violet oval handstamp on 3¢ green entire to San Francisco with black company frank at top, minor tear at top not affecting frank, Very Fine and rare. 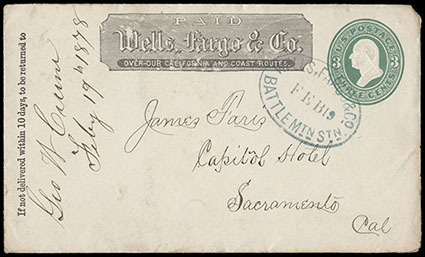 Wells, Fargo & Co./Candelaria, Nev., oval handstamp on 3¢ green entire with company frank to San Francisco, slight restoration at right, F.-V.F., a rare Wells, Fargo & Co. handstamp. Candelaria was known as a raucous silver mining town, which surely lived up to its sordid reputation on the day in 1880 when unarmed Candelaria Wells Fargo Agent Peter Traver was shot and killed by miner Mike Owens, who was angry over the fact that Traver had paid him for his labors by check instead of in cash. 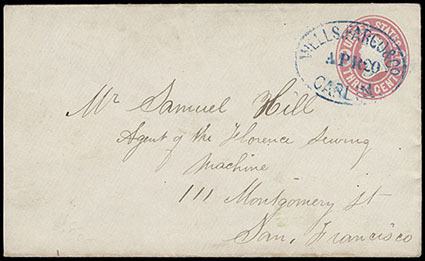 Wells, Fargo & Co., Carlin [Nev.], Apr 20, blue oval datestamp on 3¢ pink entire (U58) to San Francisco, no printed frank; docketed "1869" on reverse, Very Fine. 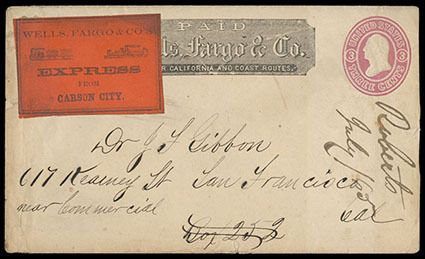 Wells, Fargo & Co's Express, From Carson City, black on orange label with manuscript town designation, affixed on yellow legal-size cover to San Francisco, docketed at left "per W.F. & Co. Express & Deans Express to be recorded and returned", additional docketing "Charges $4.00/Deans $1.00/Adv. 5.00", Very Fine and choice. We are unable to find any information on "Deans Express" and this cover would benefit from further research. There was a Dean's Ranch near Palisade, Nev. and a Dean City near Battle Mountain Nev.
Wells, Fargo & Co's Express, From Carson City., orange label affixed to 3¢ pink entire with black company frank to San Francisco, docketed "July '65", Very Fine and scarce, ex-Lichtenstein.